Welcome to a great experience at the McMinnville Inn. No matter whether it’s a business trip or a vacation that brings you to the area, our goal is to provide you a pleasant, welcoming experience in the Oregon Wine Country that will meet your needs and exceed your expectations. Located near many popular restaurants, wineries and attractions, we’re right where in want to be. Our pet-friendly hotel in McMinnville, OR features 59 well-appointed guest rooms designed to feel like a home away from home for travelers staying with us. All rooms are non-smoking for the comfort of all guests. Plus, we offer several room types designed with the needs of all types of travelers in mind. 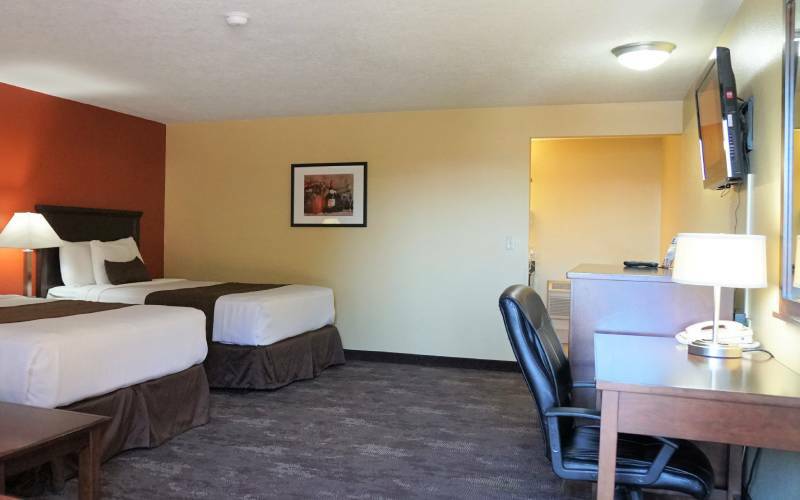 All of our rooms include free wifi and a work area, 32-inch LCD televisions with premium cable service and free bath amenities. Rooms also include a refrigerator, microwave, coffeemaker and iron with ironing board. Local calls from our hotel are always free. Staying with us puts you in a great position to explore Willamette Valley, the local wineries and more. Take a look at the exhibits at Evergreen Aviation and Space Museum during your stay in the area and try your hand at the fun machines at Spirit Mountain Casino. There’s often something interesting at Salem Convention Center, not far away, and Red Hills Lake is sure to attract your attention for its many recreational opportunities. Perhaps the best thing about staying at the McMinnville Inn is our expert guest services. We choose great people to work for us and make sure they have full training in satisfying our guests. By offering you great facilities managed by good people, you’re sure to have the most pleasant experience possible. Why not book a room with us now and experience some Oregon Wine Country hospitality? We look forward to serving you. When looking for McMinnville, OR budget hotels, look no further than our quaint, charming independent property, the McMinnville Inn. Hotels near Willamette Valley aren’t all the same, and you can save a lot of money when you choose to stay with us instead of one of our high-priced chain competitors. Hotels in McMinnville, OR vary a lot, and you and your family owe it to yourself to see the difference when you stay with us. Make us your first choice in the area and you’ll be sure from the moment you step inside that you’re staying in the right place. We make visiting this dynamic and interesting area a true pleasure you’ll want to repeat again and again. For vacation travel, make the smart choice in McMinnville, OR motels. At the McMinnville Inn, we’re pleased to be the right place to enjoy one night in the area or several -- no matter what brings you here. Our Oregon Wine Country hotel is your first and best choice of lodging in McMinnville, Oregon if you want a great vacation experience combined with comfort and amenities that you might only expect from higher-priced hotel. Take the time to consider other options if you must, then stay with us for your vacation in complete confidence. We’ll be here for you when you need us with a great Oregon experience you‘ll enjoy telling your friends, neighbors and colleagues about. No matter why you’re traveling, an affordable hotel stay can enhance the experience and save you some money so you can spend it on what really matters to you at your destination. Among hotels in McMinnville, Oregon, we at the McMinnville Inn are pleased to offer the very best experience along with a price that really makes sense for you. Hotels in Oregon Wine Country can be overpriced -- even if you’re not actually here for the wine. But you don’t have to pay a premium when you choose our fine independent property. Depend on us for an affordable hotel stay that will meet your expectations and exceed your wildest imaginings. McMinnville, Oregon hotels aren’t all the same, but you can be sure to get a great experience when you choose our independent hotel, the McMinnville Inn. As the best of the Minnville and Willamette Valley, OR hotels, we focus on offering the ultimate travel experience. This includes great comfort, excellent amenities, a sensible price and a safe and peaceful experience that any kind of traveler will find relaxing and enjoyable. Book a room now at our hotel and experience the very best of small-town hospitality along with attractions you simply can’t find anywhere else. We’ll be here for you when you need us at the McMinnville Inn in the Oregon Wine Country and near so much more. Evergreen Aviation and Space Museum, near our McMinnville, Oregon hotel, has exhibits that you can’t see anywhere else. Why not give them a visit while here? Spirit Mountain Casino is near the McMinnville Inn and offers quality gaming options in a comfortable, friendly atmosphere. Why not try your hand at it? Salem Convention Center is home to great events all year long and is remarkably close to our hotel in McMinnville, Oregon. Why not stay with us? Red Hills Lake offers unmatched recreational opportunities that you’re sure to enjoy, no matter what brings you to the Oregon Wine Country.